The durability of cement-based materials such as mortar and concrete typically suffers from water penetration, resulting in corrosion of steel structures embedded inside the material, and therefore to damage and weakness of the building structure. Here a mortar hybrid material is presented where a bacterial biofilm is supplemented, increasing the hydrophobic properties. Bacterial biofilms are ubiquitous communities of bacteria encased in a matrix of self-produced biopolymers. In such a biofilm matrix, the bacteria are able to resist various environmental challenges, e.g., chemicals, desiccation, or removal from surfaces. 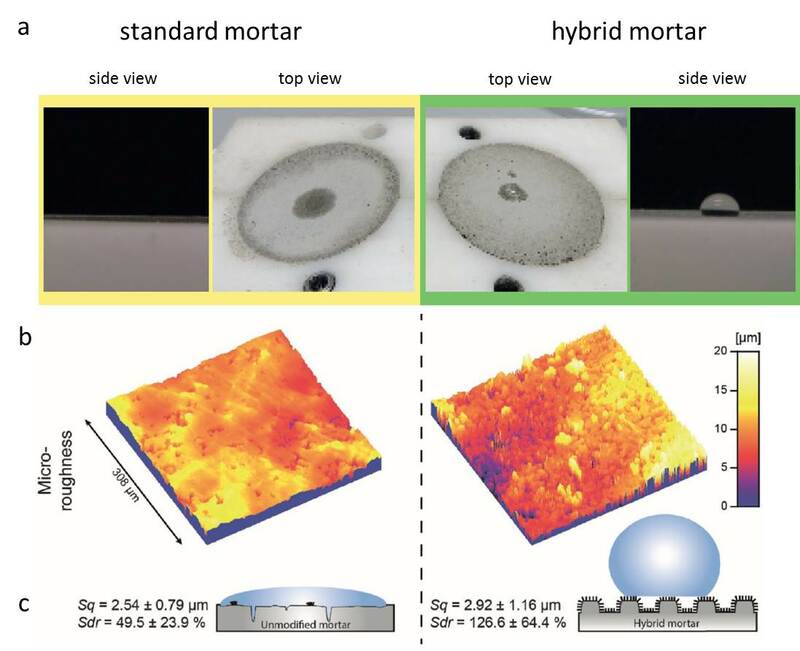 With this addition of biofilm to mortar, the material exhibits an increased roughness on the microscale and the nanoscale, and on both the outer and inner surface, imitating the lotus effect (see Figure below). Figure: The hybrid mortar exhibits increased micro- and nano-roughness. a) Wetting behavior of a water drop on unmodified mortar and biofilm-enriched hybrid mortar. b) light profilometry images. bc - biofilm content, wc - water/cement ratio. Sq values represent the root-mean-square roughness of the samples and Sdr values the developed interfacial area ratio. c) A schematic of the topological changes responsible for the increased wetting resistance of hybrid mortar.